Good morning FabFree! 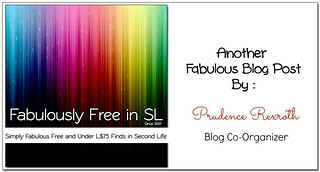 As Aline mentioned recently [HERE]… There is a really nice hunt going on that is being hosted by SLF&O. There are tons of fantastic free prizes from some really talented designers! The item you seek is an orange leaf. A Whole Outfit For FREE! What am I wearing today? I am wearing the SLF&O Hunt prize by Stormcrow Designs that includes the jeans, boots and sweater with a texture change HUD! That’s right… all three matching pieces with colour options for the top… how sweet is that? Categories: Free, hunts, mesh, pants, shirt, shoes | Tags: 0L free, Catwa, fab free, fabfree, fabulously free in SL, free in sl, Glam Affair, Ikon, Love Trill, maitreya, Second Life, Second Life Free, sl, sl free, SL Freebies, sl gift, SLF&O Hunt, Stormcrow Designs, TRUTH, Witchwood | Permalink.